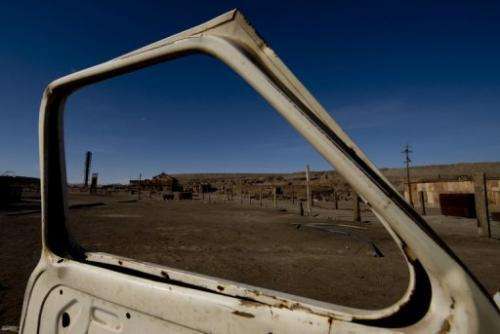 This file photo shows former Humberstone saltpeter near Pozo Almonte in the Atacama Desert of Chile, pictured on November 14, 2012. Two thirds of Chile's territory is facing desertification in which the bone-dry Atacama Desert grows by over a meter a day, President Sebastian Pinera has warned. Two thirds of Chile's territory is facing desertification in which the bone-dry Atacama Desert grows by over a meter (3.3 feet) a day, President Sebastian Pinera warned. The changing topography and consequences for the land "is one of the greatest threats to sustained development, and to sustainable development, and to the quality of life of millions of people around the world," Pinera said on Monday, in an address marking World Day to Combat Desertification and Drought. "It is estimated that two thirds of our territory, about 48 million hectares (119 million acres), are affected in some measure by desertification," he added. "This means that more than 1.5 million fellow Chileans are living with and suffering with consequences of this desertification." In 2007, Chile launched a program that tries to combat the desert's march, involving a series of small dams, cloud seeding to increase rain, reforesting and soil improvement work. It's a start, but it has not stopped desertification yet.